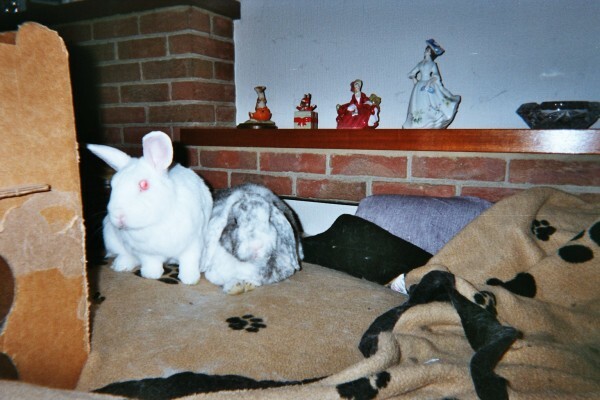 15 years ago today and it was party time for Dandy & Flopsy-Girl. You know I think that the 2-foots were almost as relieved as I was that Flopsy Girl is her normal self again. Anyway, I'm guessing that's the reason that they let us play out all of last night, AND DID WE PARTY! We ran round the house, we played with all of our toys, we ate every scrap of food we could find, and we generally made as much noise and nuisance as we could the whole night long, and we STILL got some treats this morning. Hello, we are pleased to read that Flopsy Girl is much better .. what a scare. I'm unfortunately a little poorly myself. After giving my 2-foot a scare, she whisked me off to the vets to find I have some sort of cold. I can't really remember what the whole outcome was as I was too engrossed with all the lovely attention I was receiving .... apart from having my temperature taken! My 2foot knows all about my problem and is looking after me very well, although I have to have more medication.